The Taiwanese Acer has gone one step further when offering gaming hardware – the company has announced the release of the new Predator Z850 gaming projector. First seen at CES 2016, the projector is said to be the world’s first aimed at gaming crowds. The device arrives with a number of interesting features that include high 3000 ANSI lumens of brightness, a laser illumination technology for bright and rich colors, support for 24:9 ultra-wide HD imagery and a mirror-less ultra-short-throw technology that can project large images up to 120 inches from as little as 18.5 inches from the screen. In addition to all these features the 120-inch projected display is much less likely to suffer from shadow interference in crucial game moments compared to other projectors. The Predator Z850 also does not require a special stand/mount – the projector has adjustable feet and sits below and relatively close to the projection surface. Furthermore, the device has a special laser diode inside its chassis that can deliver wide color gamut images at up to 3000 lumens and with a 100 000:1 contrast ratio for deep black and nice white colors. 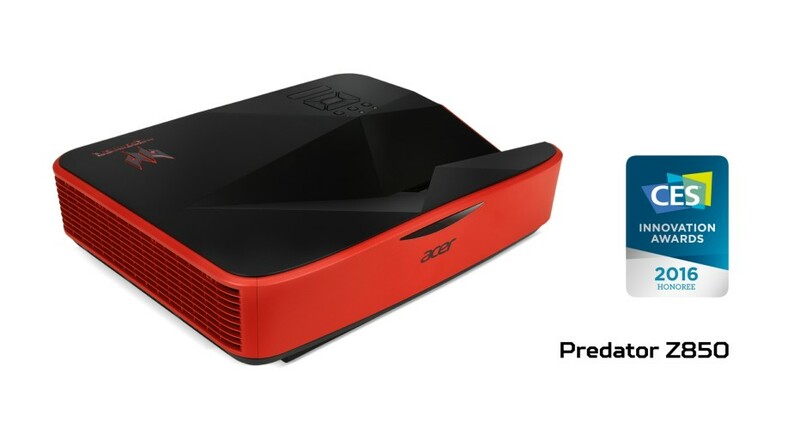 The Z850 supports Acer’s ColorBoost3D and ColorSafe technologies too and in the back you will find a number of connectivity ports – LAN, HDMI, VGA and others but the projector lacks a DisplayPort connector. An optional wireless HD-kit to enable 1080p lossless wireless streaming is also available. Moreover, the new Acer product does not need cooling time so you can pack it and go once you are finished playing. Isn’t this nice? What’s not nice is the price – Acer wants USD 4999 for the Predator Z850, which automatically rules it out for most users out there and in addition the product specifications will vary depending on where you live. The device should be on the market this month.